There are many choices of refrigerator for RVs. Gas or 12v. Front loading or top loading. Ice boxes. And then there's the Eutectic Fridges. We hadn't known much about Eutectic fridges until we met some yachties in French Guiana. These were long term yachties who, much like we live in our bus and travel from place to place they live on a boat and travel from place to place. Only, when you cross the Atlantic Ocean in a yacht you need to know you have systems and equipment that won't let you down. These yachties, that we met while buying veggies at a market, taught us that the most efficient system is Eutectic. They also recommended that we buy one from an Australian company: Ozefridge. Ozefridge have a great website which explained the system, how to build it, and gives pricing (www.ozefridge.com.au). But, if you aren't sure about anything they're also available to help over the phone or email. 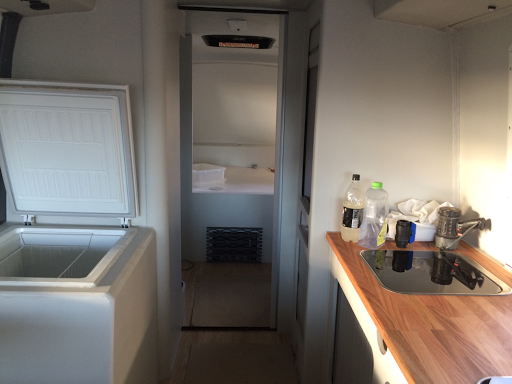 When we told them about our bus conversion project they suggested that, rather than building a box from scratch, we start by buying a small chest freezer (an old used and one), and use it as part freezer (where the plates are installed) and part fridge. So we did ($50). We bought 2 eutectic plates and a compressor from Ozefridge. 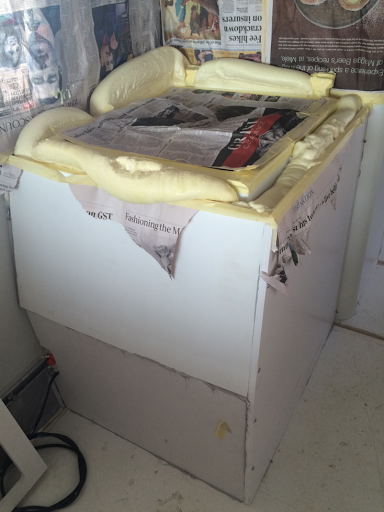 We built the old freezer box into the motorhome with some serious insulation (key to efficiency in refrigeration), installed the plates on opposing side walls at the bottom of the box (freezer section), built a removable barrier above that (so, fridge above, freezer below), and kept the old freezer basket in the fridge section for better access. Because our freezer is at the bottom the coldest air stays down there and just enough cold air comes up for our fridge. In fact the bottom of our fridge section is very cold: good for drinks, meats. The top is great for vegetables and fruits. All in all we are extremely happy with our eutectic fridge.